Asian Games 2018 Highlights: Shardul Vihan wins silver on Day 5 of Asian Games in Men's Double Trap event. Asian Games 2018 Live Streaming India Shooting Live Score and Updates: Shardul Vihan wins silver. Asian Games 2018 India Shooting Highlights: Teenager Shardul Vihan finishes Day 5 for shooting with a silver medal even though the women’s team India fail to grab a medal in Women’s Double Trap. The 15-year old did well at the top for most of the final but missed a few shots in the final shootout round with the winner. In the Women’s double trap, Shreyasi Singh finish in the 6th position with 121 points while Varsha Varman finish in the 7th position with 120 points. And with that comes an end to today's events in shooting for India. You can follow the rest of the events in which India are participating here. In the second round, Vihan misses the third shot while Sungin misses two. With that the Korean takes gold while the Indian shooter settles for silver in his first ever Asian Games. Shardul Vihan from Meerut misses the first shot, takes all the rest. His opponent Korea's Sungin, however, shoots all on target in the first round. China's Anlong follows the other two in elimination. Qatar's Hamad Ali takes the third spot and with that bronze. Vihan and Korea's Sungjin play for gold medal. After 40 shots, Vihan continues to lead at the top with a total of 37 shots. He is followed by Qatar's Hamad Ali. Korea's Sungjin and United Arab Emirates' Khaled are eliminated. Shardul Vihan is in action now in Final of Double Trap. And he is currently leading at the top with 32 shots on target out of 34. India fail to grab a medal in Women's Double Trap. Shreyasi Singh finish in the 6th position with 121 points while Varsha Varman finish in the 7th position with 120 points. Vihan Shardul qualifies for the final in Men's Double Trap with a score of 141. Ankur Mittal fails to qualify. Varsha Varman scores 24 in the 4th serties and now has a total score of 96. Shreyasi Singh scores 25 in the 4th series. Varsha Varman scored 26 in the third series. Shreyasi Singh scores 71 in the third series. Varsha Varman scores 26 in her first round - Shreyasi Singh scores 22 in the second series. Varsha Varman scores 20 in her first round - Shreyasi Singh scores 23. It is time for India to look for another medal in shooting - Varsha Varman and Shreyasi Singh compete in Women's Double Trap Finals. Men's Double Trap Qualification round has started with Ankur Mittal and Vihan Shardul eyeing a place in the final. Asian Games 2018 Live Streaming India Shooting Live Score and Updates: Rahi Sarnobat won gold. 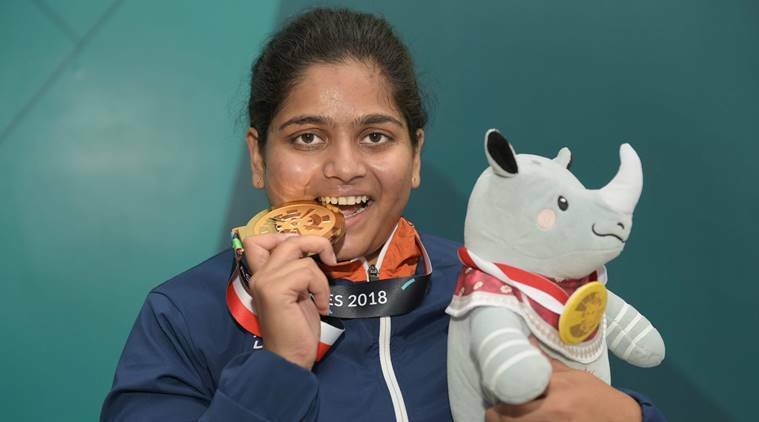 Asian Games 2018 Live Streaming India Shooting Live Score and Updates: Rahi Sarnobat of India won the gold medal for India in 25m pistol shooting event at the Asian Games. The shooter scored a total of 34 and then had to battle it out in two tie-breakers against Thailand's Naphaswan Yangpaiboon to finally win the gold. Manu Bhaker, who topped the qualifying stage with Asian Games record, finished in the 6th position. It is India's second gold medal in shooting, and the 7th overall at the Asian Games.